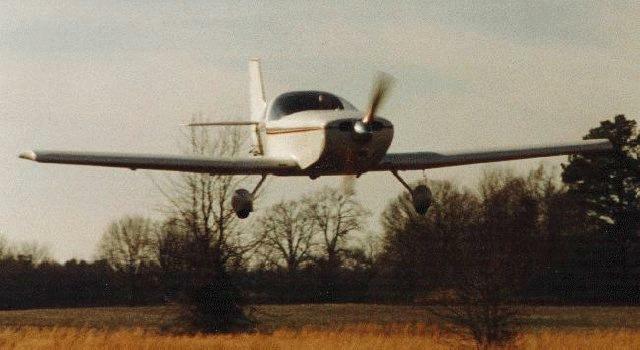 Jim Hill's KR2 doing 200mph flyby at Hazel Green airport, trying to get a better look at the windsock. This page features some KR2S projects under construction in an effort to provide insight into the KR building process. Also, there are several completed KRs featured, as well as material sources to help you get your project started. The 97 KR Gathering will be held in Perry, Oklahoma on Sept 19, 20, and 21, 1997. The KR Dinner will be Saturday night. Don Betcham is hosting the affair. You can expect about 15-20 KR aircraft to fly in for the Gathering. This is THE place to learn about KR aircraft so don't miss it! The KRNET list is an email list devoted to exchanging information about the KR. To subscribe (it's free! ), send a message to majordomo@teleport.com with the message "subscribe krnet-l yourname@xyz.com" in the text body (no quotes). That's KRNET-L, not KRNET-1, but lower case. To send messages to the list, send email to krnet-l@teleport.com. You must be a member to post messages to the list, and it usually takes a few days for the adminstrator to add you, so be patient. Past KRNET KR list transcripts are available, maintained by Carlos Sa. If you'd like to submit articles or photos, email Randy Stein at BSHADR@aol.com. He likes to receive them in Word 7.0 format with images embedded. Please send him some good articles. We hate so hear him whine and whimper as his deadline approaches. vw-request@toast.ml.org with the message "subscribe" in the body. After you are added to the list by the system administrator, you may submit messages to the group by emailing to vw@toast.ml.org. This list is devoted to the use of VW and 1/2 VW engines in aircraft. There is a KR2S forum on America Online under Interests, General Aviation, Homebuilts, KR2S builders, but activity there has been sparse since the advent of KRNET. Manufacturer of the KR1, KR2 and KR2S plans and kits. If you'd like to submit some images for this page, zip up some 72 dpi JPG images (PC version of PKZip) and email them to me at the address at the bottom of this page.